It started as a blizzard. We drove towards Leadville, leaving Fort Collins with the radio chirping about the impending conditions, and we were driving straight west, straight towards the storm. After three hours, numerous podcasts and timid discussions of turning back, we made it to the trail head, no sign of the others’ cars we were supposed to see. We drove up and down the snow covered roads, ultimately finding ourselves in a tight spot, forced to turn back and navigate the dense wilderness, choosing our paths wisely. Finally, after realizing we didn’t have many options, we ran into our fellow hikers that we were scheduled to meet. Adorning our packs, we were already soaked from the heavy, wet snow as we started up the single track trail towards our goal. The hut, 10th Mountain, was about 5 miles up the path, one on which I had hiked years prior with a much different group of characters. After keeping a steady, but slow pace with our two other hikers, Christie and I (pictured above) decided to continue on, not separating too far ahead of our comrades. 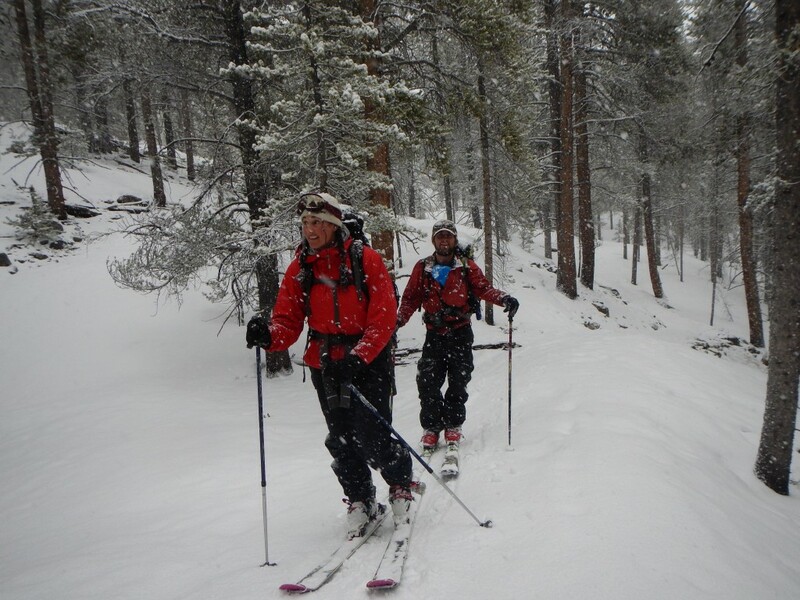 It continued to snow, no sign of it letting up, and we continued with our small steps, sliding our heavy skis below us. Unknowingly reaching the last half mile of our ski, we lost the trail in an open field, no trail markers to be seen, and we decided to go up the steeper pitch. “We have to be close”, we thought to ourselves. The trees closed in, the wind picked up, and we had almost reached another opening in the forest just ahead. By the time we arrived to the edge of the trees, we could smell a fire, but the snow was falling so heavily, we weren’t able to see any smoke. We traveled just a few steps further, and just over a small hill we could see the snow covered roof. It was a welcome sight after almost 7 miles of hiking and losing the trail in the last 15 minutes. The fire was warm and the company sweet as we dried off, warmed up and focused on eating some sustenance. The next day, after relishing in the early morning snow accumulation, 4 of the 18 hut dwellers decided it was time to ski while the rest raveled up by snowshoe. Skinning high above the hut, we found a suitably steep hill, selected a “safest route” and flipped our heel risers up. It was over 18″ of fresh powder, and after the first run, we knew we had to climb back up for another lap. We returned to the hut with snow stacked beanies and smiles on our faces. The rest of our group was curious of our adventure, and we already knew we would return for more laps later that afternoon. The food was plentiful, the card games entertaining and fires warm as we cozied in after a large day of powder hunting. The snow didn’t let up the rest of the weekend. The only glimpse of sun was on Sunday, our last day of the hut, when we made our exit relatively early. The snow had piled so high by our last day that sliding down the hill was quite the chore, pushing loads of snow ahead of our boots as we pushed down the slope. Our cars were all covered in the white fluff and the snowshoers arrived very shortly after we had. The hike down had been tough, and the snow continued to fall. The trip allowed for the most back country skiing I had ever experienced, and proved that driving towards the storm can allow for an exhausting, but rewarding trip. It ended as a blizzard.